This stylish save the date card is digitally printed on round smooth white vellum card stock and features your favorite photo as the backdrop for your wording details. This stylish save the date card is digitally printed on round smooth white vellum card stock and features your favorite photo as the backdrop for your wording details. Although shown here for a wedding, this save the date would be equally suitable for a Bar or Bat Mitzvah. Measures 6-1/2″ in diameter. This save the date card is accompanied by single bright white envelopes. Due to the square shape of the envelopes, additional postage is required. Please consult your local post office for details prior to mailing. 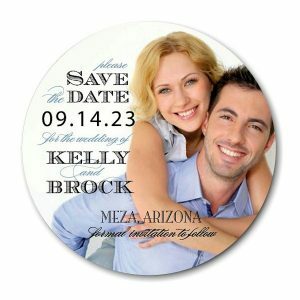 Indicate below the wording that you would like to appear on your save the date cards.